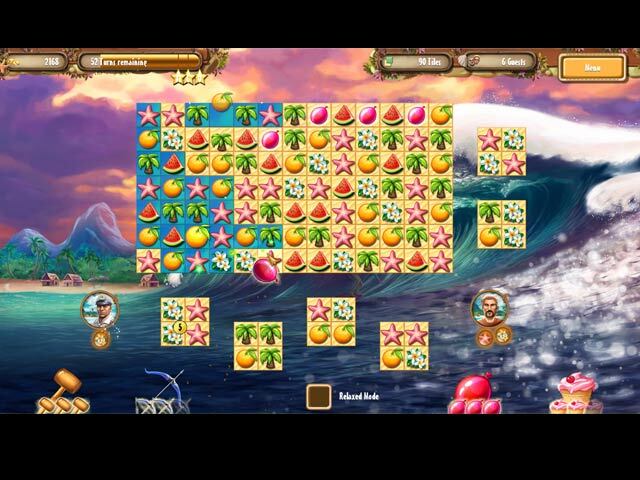 Help Lucy in this colourful Match 3 game to get her 5 stars and enjoy the pure summertime feeling. On the beach and beneath the palm trees many engaging tasks and exciting challenges await you. 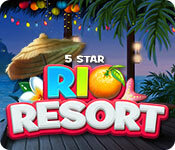 Earn extra cash in Match 3 levels and Solitaire mini games to make the holiday resort of your dreams come true. 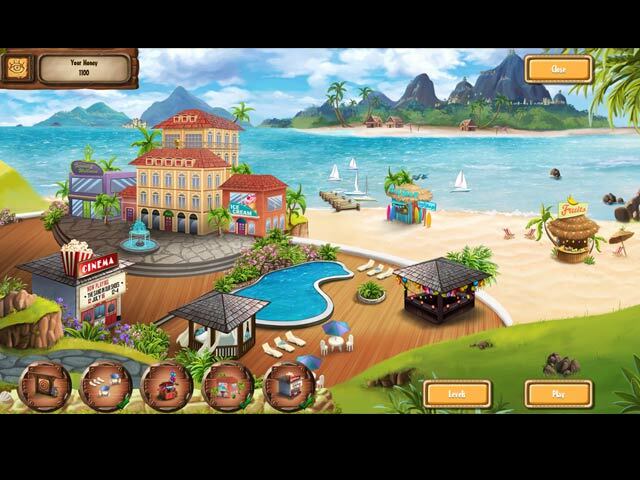 Experience all the magic of the South Seas and create the perfect holiday destination! 5 Star Rio Resort is rated 3.9 out of 5 by 32. Rated 5 out of 5 by bessiegirl from You need to use strategy I play a lot of match 3's and this has to be one of the best match 3 games which required a definate use of strategy. Playing on "normal" mode you have limited moves and gives you "stars" to shoot for although I have no idea what collecting stars does, but playing in normal mode makes the game much more fun. I played the game twice to try and beat my score and it did seem as if some of the board changed, or maybe I just forget, but I actually had to resort to the "relaxed" mode on one of the levels I had beaten before. I believe it has a lot to do with how you use your powerups. One of the best parts of this game is you get to keep the powerups you acquire despite the fact you "lose" the level and have to replay. Lots of strategy in this game which makes it really fun...with no stress really. When I first started playing, I thought it was kind of a dorky game, but don't let that fool you. Rated 5 out of 5 by deddu from TRULY A FIVE STAR RESORT AND GAME The developers put everything into this game and made it really fun. Very colorful boards and, of course, you get power-ups to help. You also have to get rid of the "guests" on the board which can lose you stars. However, you can played relaxed so you only get one star, or just replay the board until you win. Rated 5 out of 5 by denniann2 from great M3 game you are building a resort to prove to your dad that you are capable of doing it. the power ups are not the rechargable kind but you need to drop them to the bottom of the board and collect them. each board provides enough to finish the boards you just have to be careful how you use them and try to be sure to get them all for future use......it does end with a statement of more to come. Rated 5 out of 5 by meme2222 from A bit confusing but great game This game has 3 modes. Why they didn't put all three of these in the options button is very confusing. Starting out it looks like only two modes : casual meaning easy with a greater amount of moves, and normal, but it does have a relax mode also. You can choose this option in game at bottom of playing board for unlimited moves. If you want challenge choose normal. I found casual playing best suited for me because you don't have to strategize every move and it was sufficient to win level. It gives you a little less challenge trying to get 3 stars and still enjoy carefree swapping. If you choose the relaxed mode you cannot compete for stars. You will only get one star per level. The amount of coins you win is dependent on the amount of stars you earn. No level is timed but it does have obstacles that grow on board that you need to remove before it spreads. Ex. water tiles will flood your board or chocolate will melt which will give you more obstacles to remove to win level. Another confusing thing is the layout of board. Some levels you need to use the power ups to finish the board or else you can't get at the obstacles that need removing. Ex is level 12. you MUST use the hammer to click the top tile that is offset of the game board. They will have other levels throughout game similar to this where you will have stagnant tiles that have no moves unless you use a certain power up. Third confusing thing is the solitaire games. They are located in different buildings in the hotel scene that you buy with your coins. The janitor room, the balloon stand, the ice cream shop, the bar and the pavilion. After you buy these bldgs. you can click on them and play a higher, lower solitaire, but all of them are the same. I thought you could play for the corresponding power-ups like the hammer, balloon, ice cream, and arrow, but after each win it only awards an undo for the card games and coins. I WANT POWER-UPS TO USE FOR THE M3. Oh well, that is very confusing if it only unlocks them, but yet you can go back and continue to play only for coins. But why do we need 5 SAME TYPE solitaire mini games in 5 different buildings? I played 5 games of solitaire in the balloon shop and thought I would get 5 balloons, but I didn't . If anyone can figure that out can you please state it in a review. I'm confused. But overall it is still a great game. Love the O.J. when it explodes and all the coins dropping. Smooth graphics, colorful fun tiles, contemporary theme, great cascades. Its full of obstacles but not too many to make it tedious. Has good power ups you must drop off board. Mini game to get extra coins is a plus. Story is ok but you can skip if you just want to play M3. Also loved serving the clients by matching 4 or more, that was unique. My only con is not being able to generate more of the power ups except for the orange juice. I guess it adds to the challenge but if you could save it and use wherever you want on the board would of been more fun. The other power ups that drop off the board are limited in number and must save for the stagnant pieces to pass level. So use them wisely or you will be confused how to finish the level. Rated 5 out of 5 by MissMaddie from OMGosh! Love this Match 3. It has all the elements of a fun, challenging game! Money well spent...don't wait. If you enjoy Match 3 games with addicting music...this is it! Rated 5 out of 5 by wildlifecrusader from Excellent game ! What a beautiful , fun Match 3 game. Exactly what everyone needs to rewind , relax and be entertained . It is colourful , inviting and has holidays written all over it. Played part of the trail and bought it. It is not to easy , but no worries every level can be replayed as often as you like. Have fun in the sun and come to Rio . Rated 5 out of 5 by Lyndy20 from Pleasantly challenging Can I make a 5 Star Resort? I don't know, yet, but I can certainly give 5 stars! 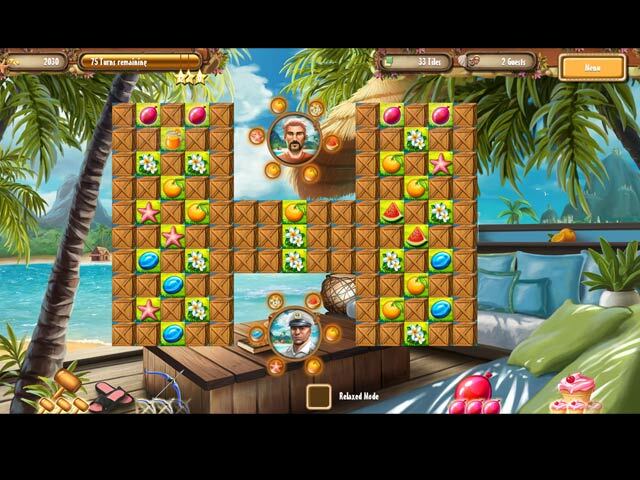 This game is bright, colourful, a Match 3 builder with mini games and variety. There's lots to do. Play in limited moves mode or casual, or switch back and forth. I always enjoy limited moves mode as it adds a strategic challenge to the game. This is certainly so in Rio, where you are meeting the needs of the hotel guests as well as the other goals of the level. This is sure to be an entertaining and challenging game.